Home > Shop By Brand > Pinnacle Natural Brilliance > Pinnacle Liquid Souveran Wax 128 oz. Liquid Souveran Car Wax achieves the Pinnacle of paint perfection! Pinnacle Liquid Souverän Car Wax is the quintessential example of the sizzling shine and winter-tough durability that liquid carnauba car waxes are capable of when formulated using advanced chemistry. Pinnacle Liquid Souverän Car Wax features Brazil’s highest grade carnauba wax fused with Pinnacle’s signature crystalline polymers that were developed right here in south Florida. This advanced blend of high-grade Brazilian carnauba wax and advanced polymers delivers a deep, dazzling shine and a length of paint protection that was once exclusive to synthetic paint sealants. 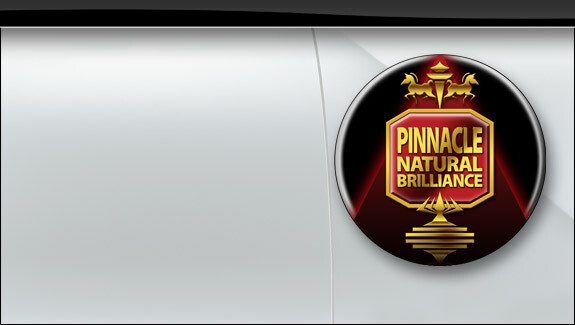 Pinnacle Liquid Souverän Car Wax is formulated using the maximum amount of carnauba wax possible in a liquid formula. Before the carnauba wax is liquefied it goes through a refining process that was originally developed exclusively for Pinnacle’s flagship Souverän Paste Wax. After the carnauba wax is refined and all the impurities are removed, Pinnacle’s proprietary crystalline polymers are then fused with the wax. This unique blending process makes Pinnacle Liquid Souverän Car Wax unlike any other liquid car wax available. 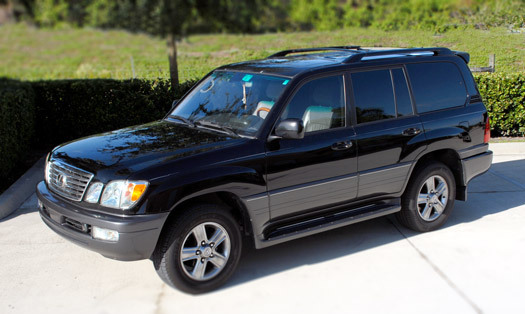 Pinnacle Liquid Souveran Car Wax creates a glossy, reflective finish on this black Lexus LX470. Pinnacle’s signature crystalline polymers strengthen the wax’s bond to the surface when applied to the paint. These polymers cross-link on the surface, forming a strong bond that lasts months, not weeks. While the crystalline polymers act to strengthen the carnauba wax at its core, they also provide a glossy, reflective shine that compliments the deep, warm glow of the carnauba wax. Your vehicle’s paint will have superb depth, richness, and clarity that is unmistakably Pinnacle. Pinnacle Liquid Souverän Car Wax provides excellent paint protection in any environment. Carnauba car waxes aren’t typically known for being durable because of their low melting point but Liquid Souverän Car Wax was developed and tested in south Florida – one of the most intense areas on the planet for sun exposure. Pinnacle Liquid Souverän Car Wax provides excellent UV protection and has a melting point that far exceeds that of a typical carnauba car wax. Pinnacle Liquid Souverän Car Wax provides the type of paint protection that used to be reserved for synthetic paint sealants, but without the artificial shine. You could say that Pinnacle Liquid Souverän Car Wax gives you the best of both worlds – the deep, wet shine of a carnauba wax and the winter-tough durability of a paint sealant – in an easy to use liquid wax. Apply by hand with a Pinnacle Polishin' Pal..
Or with a dual action polisher equipped with a soft foam finishing pad.. The advanced crystalline polymers found in Liquid Souverän Car Wax create an immense amount of surface tension so water beads up and rolls off. This surface tension also works to repel sleet and snow, leaving your vehicle cleaner during the winter months. The crystalline polymers were also formulated to provide a tough barrier against road salt, bugs, tar, bird droppings and other airborne contaminants. Pinnacle Liquid Souverän Car Wax provides the utmost in paint protection without sacrificing the deep, dazzling shine that users of Pinnacle waxes have become accustomed to. 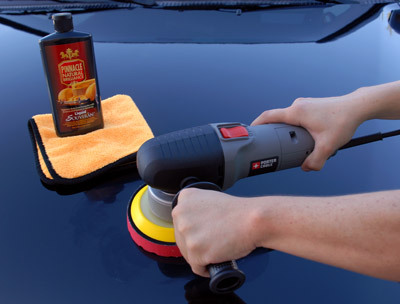 Durability and ease of use are two traits that are not usually expected in a liquid carnauba car wax. Pinnacle Liquid Souverän Car Wax was formulated to be exceptionally easy to apply and remove, even in humid climates (remember, it was developed and tested in south Florida!). 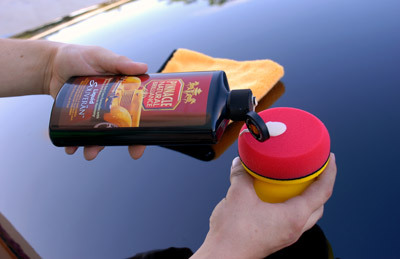 Liquid Souverän Car Wax won’t stain plastic trim and it won’t dust or flake when you wipe it off. Liquid Souverän Car Wax can be applied by hand or with a machine! Pinnacle Liquid Souverän Car Wax is a pure wax and doesn’t contain any cleaners or abrasives. For best results, use Pinnacle Paintwork Cleansing Lotion before you apply Liquid Souverän Car Wax. Pinnacle Paintwork Cleansing Lotion is a non-abrasive paint cleanser that removes previously applied waxes and other impurities, enhancing the paint’s gloss. It will leave the paint squeaky clean so when Liquid Souverän Car Wax is applied, you’ll achieve the maximum depth of shine and durability. Don’t sacrifice the deep, warm carnauba glow in the name of durability! Thanks in part to its Brazilian carnauba wax and advanced crystalline polymers, Pinnacle Liquid Souverän Car Wax provides superior paint protection without sacrificing the sizzling shine that Pinnacle wax enthusiasts have come to know and love. Liquid Souverän should be applied to paint that's free of contaminants and previously applied waxes and sealants. Use Pinnacle Ultra Poly Clay to remove above surface contaminants and Pinnacle Paintwork Cleansing Lotion to polish the surface. This will enable Liquid Souveran to form a complete bond to the surface, enabling maximum durability and shine. Very important - apply a THIN coat! Apply a Nickel size amount of wax on the applicator and wipe a thin coat of wax on the surface using a circular or back-and-forth motion. This wax is not fussy. Use a motion that you are comfortable with. The beauty of this liquid wax is that you can do sections or the whole vehicle at once. Work on a cool surface, out of direct sunlight. Allow the wax to dry to a light haze and buff off using a clean, soft microfiber towel. Don't hesitate to apply this wax with a machine. Use a red or blue finishing pad with your Porter Cable 7424xp. Set the speed setting between 3 and 4. Work in a back and forth, then up and down motion. There's no need to apply pressure. Buff using a microfiber towel or a microfiber bonnet over a Lambswool 6 Inch Leveling Pad. *Multiple coats deepen the glossy, wet, 3-Dimensional look. If you choose to apply a 2nd or 3rd coat, wait 24 hours in between applications. Also, wait a day to wash after waxing. Kit Savings -See our Pinnacle Liquid Souverän™ Concours Kit and others on the Car Care Kits Page for super savings on this and other Pinnacle Products! As an auto detailer, I don't feel right using anything less on my customers' vehicles! For the price, you can't beat this. Results look phenomenal in our beautiful Moab sunshine. That's why I started buying it by the gallon. ProsSuper easy application. Buffs off just as easily.